Fair Go Casino is an Australian themed online casino, which is owned and operated by Deckmedia. 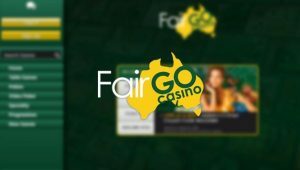 Licensed in Curacao, Fair Go Casino is decorated with the Aussie colours and oozes everything connected with players located down under. From the country silhouette logo to the casino koala mascot, this casino gives players the opportunity to ‘explore the continent of pokies and bonuses’. The casino has been operating since 2017 and is backed by the power of Deckmedia – a formidable force in the online gambling industry with a number of reputable brands under its umbrella including Black Diamond Casino. Fair Go Casino NZ is multi-device compatible, meaning that one account can get you playing on any device you choose, including mobile, tablet and desktop computers. The casino offers a wide range of games and a good selection of banking methods, including Bitcoin – allowing players to play games using crytocurrency instead of the usual cash games. For players with any doubts, Fair Go has an extensive support system in place offering a variety of ways to contact a member of their team with any queries you may have. Fair Go Casino is packed to the rafters with bonuses and promotions for both new and existing players. On the dedicated promotions page, players can find everything from a generous welcome bonus and cash back, to game-specific offers and weekly free spins. As part of Fair Go Casino’s exclusive welcome package, new customers can get a 100% deposit bonus up to $200 on their first five deposits. Meaning that there is a potential total of $1000 up for grabs. In addition to the welcome package, players can take part in the daily ‘Bonus To Go’ offer, which gives players 50% extra up to $200 every day of the week. Furthermore, Fair Go Casino regularly releases promotions that are specific to a game of their choosing. This might be a new release, or a hot game title. So keep your eyes peeled for extra game bonuses such as 75% free bonus and 40 free spins on their latest pokie ‘Stardust’. Coupon codes are available for each bonus that is offered by Fair Go Casino except cash back. To claim your 25% ‘instant cashback’, simply contact a member of the Fair Go team. Fair Go Casino has struck a partnership with gaming provider RTG – Realtime Gaming. The sites game lobby brings over 150 different game titles to a players’ fingertips across a range of different categories, including Pokies and Slots, Table Games, Video Poker, Specialty games, new games and the ever popular progressive jackpots. The new games category is a welcome sight at Fair Go, something that many other casinos lack. It shows it is keen to bring players regular updates and keep things fresh for an extended lifespan. Some of the new titles hitting the lobby include; Ancient Gods, Secret Jungle, Panda’s Gold, Stardust, Scuba Fishing and Lucha Libre 2. All games feature high quality graphics and run smoothly, whichever device you play on. Some of the most popular games at Fair Go Casino include; Asgard, Aztec’s Millions, Caesar’s Empire, Cash Bandits, Crazy Vegas, Golden Lotus, Lion’s Lair, Megaquarium, Megasaur, Pirate Isle, Jumping Beans and The Three Stooges II. Players at Fair Go Casino can choose to play games in either real cash or crypto currency. Whilst the site doesn’t offer an abundance of banking methods, it does support all major, more widely used ones, including MasterCard, Visa, bank transfer and Neosurf. Neosurf is a simple, secure way to pay and play online without an active payment card. Local sales points are used to convert cash to Neosurf vouchers, whereby a unique pin code is provided for use with your deposit. For those who love crypto currencies, players can choose to deposit and withdraw winnings using Bitcoin. Fair Go Casino has a unique VIP program that is designed around each and every loyal player. If you are loyal to Fair Go, then you will have the opportunity to be rewarded with up to 40% cash back and a dedicated VIP manager who will personalise many bonuses and perks to suit you and your gaming style. Customer support at Fair Go Casino is excellent. The site provides a number of ways to contact a staff member including telephone, email and live chat. There is a toll free phone number available for players located in Australia as well as international players. Live chat is available 24 hours a day, 7 days a week. Conclusion – Is FairGo to go? up to millions of dollars up for grabs.